I’m not going to bore you with the minutiae of my processes or the research I did on this topic, so let’s just say this: North America was the home of the last of the great dinosaurs during the late Cretaceous. While their habitat changed and diminished, it did not disappear altogether, giving them time to adapt to the new conditions. Many species died off, but some survived. Surviving species were smaller than their forebears, and filled ecological niches that we would find populated with different animals in our timeline. Example, you don’t see antelope or horses roaming the Great Plains in the FC world; whistlers took that niche. Likewise, you don’t see large predatory cats, as the walkers and shadow-hunters had taken up those roles. For the “main characters” in my dinosaur-world, I generally had specific species in mind, all taken from the late Cretaceous period. For the “supporting roles,” however, I merely postulated some adaptive version of other species, not calling anything out specifically. In going through the books for this post, I was surprised at how many I actually had. The “Big Three” of the books are called walkers, whistlers, and hardbacks by the native tribes, but there are others that have specific species as their model. Walkers: Tyrannosaurus Rex (of course), with pycnofibers/down filaments to increase heat retention, semi-hibernation during winter months. Whistlers: Parasaurolophus, with chameleon-like skin to aid in camouflage. Shadow-Hunters: Dromaeosaurs of the “raptor” type. There are a handful of species mentioned in passing, for which I did not designate a specific source animal. Fishing Lizards: Smaller pterosaurs like the pterodactylus, that feed on small fish and insects. Communal cliff-dwellers, some subspecies flock together to hunt. 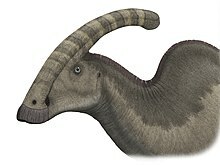 Horn-Faces: one of the many ceratopsian animals prevalent during the late Cretaceous. Duck-Bills: basic hadrosaurs, also plentiful during the late Cretaceous. Water-Walkers: small predatory animals similar to troodon. Now I’m sure some people will find fault with these choices, but remember…it’s fiction. There’s nothing to say it couldn’t have worked out this way.